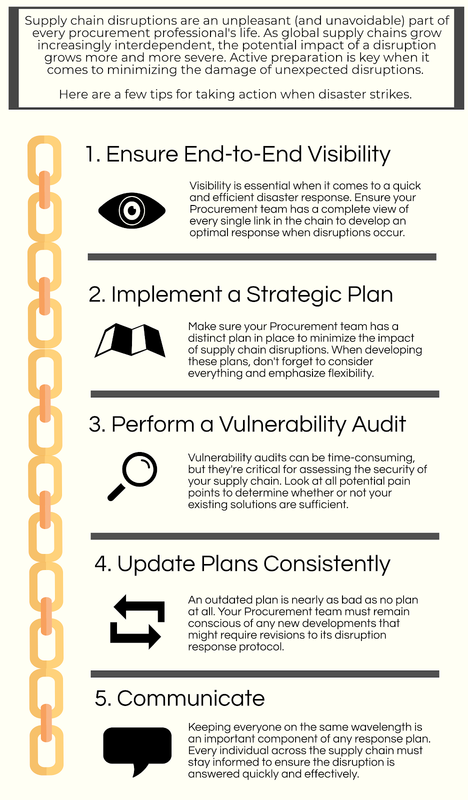 Home Best Practices Infographics How Should Procurement Respond to Supply Chain Disruptions? How Should Procurement Respond to Supply Chain Disruptions? Extreme weather, data breaches, terrorist threats, and global unrest are a fact of life as unavoidable as they are unpleasant. In today's increasingly global supply management space, risk mitigation and management are everyone's business. They have to be. A recent study by Allianz Global Corporate & Specialty found that, on average, major supply chain disruptions cost companies $4.3 million. Preparation goes a long way, but readiness can't always protect your Procurement team from facing unexpected challenges. So what can a company do when disaster strikes? Check out these tips from the risk management team at Source One. To learn more about preparing your supply chain for disruptions (both man-made and natural) contact the supply chain specialists at Source One. We'll help you develop plans of action, train your Procurement team on the appropriate protocol, and (if necessary) put your new disruption procedures into action. Don't go it alone. Give us a call today.